When incoming Academy President Roy Slade arrived at Cranbrook in July 1977, the President’s House (known, off and on, as Saarinen House) was in need of a refresher. Three other families had lived in and changed the aesthetic of the house following Eliel Saarinen’s death in 1950, and the house was a far cry from Saarinen’s design intent. Slade worked with designers Jean Faulkner and Carl Magnusson (then Director of Graphics and Showroom Design at Knoll) to rework the house into something befitting the new President of the Academy. Saarinen House, February 8, 1978. Norman McGrath, photographer. Courtesy of Cranbrook Archives. 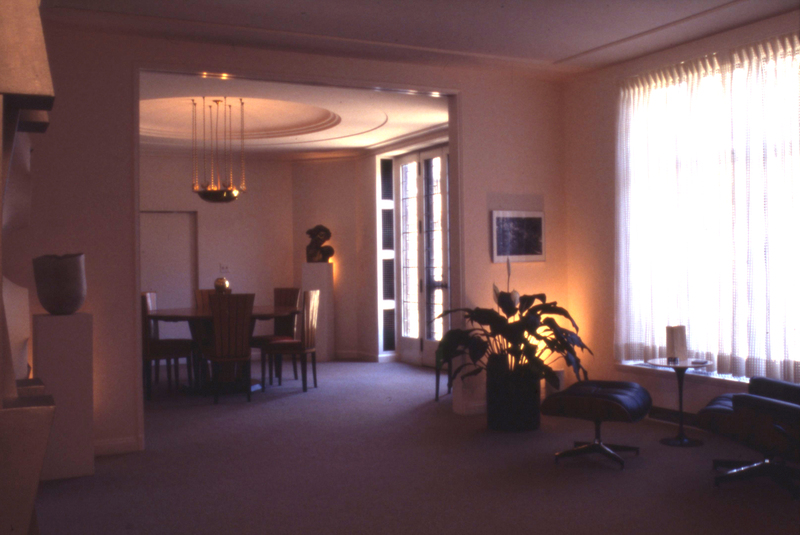 The original Saarinen-designed furniture had been spread throughout the campus and Museum, and in the redesign much of it was returned for use in the house. But instead of restoring rooms to their 1930s appearance (that would happen a decade or so later), the house was kept as a blend of old and new. “Gibraltar Ash” off-white wool wall-to-wall carpeting by Jack Lenor Larsen stretched between the foyer, living room, dining room, and library, making the main room of the house feel like one continuous open space. Furnishings and art pieces by Cranbrook (and Cranbrook-adjacent) artists and designers from many decades–not just the 1930s–were blended together into a comfortable, deliberately eclectic look. The 1977 interiors of the house were featured in local papers and even included, with text by Paul Goldberger, in Living Well: The New York Times Book of Home Design and Decoration (1981). It’s interesting in these photos by Jack Kausch how well the space works, but how alien Saarinen’s furniture seems to be! Particularly in the dining room–the holly wood table and brass fixture are decontextualized by the foreign whiteness of the walls, ceiling, and floor. The next restoration, completed in 1994, brought back Saarinen’s rich color scheme and variety of materials–including the gilded ceiling. If you’d like to learn more about the later lives of Saarinen House, Roy Slade’s tenure as President of the Academy, and other fascinating Cranbrook Academy of Art stories, come out to visit my exhibition, Saarinen House: Presidents/Residents, 1946-1994, opening later this month. The exhibition features archival material and works by each former resident: painter Zoltan Sepeshy, who directed the Academy from 1946 to 1966 and moved into the house in late 1951 following the death of Eliel Saarinen; architect Glen Paulsen, who led the Academy from 1966 to 1970 and expanded Cranbrook’s campus with late-Modern additions; Wallace Mitchell, a Detroit native whose career at Cranbrook developed from student to painting instructor, then director of the Art Museum and finally president; and painter and educator Roy Slade, who led the Academy and its Museum from 1977 to 1994. Slade initiated the restoration of Saarinen House in the late 1970s and encouraged and supported Greg Wittkopp (then a curator at the Art Museum) in the transformation of this early modern, Art Deco design treasure into a public house museum in 1994. The free Opening Reception will take place Sunday, April 29, 2018, from 1pm-5pm (in conjunction with Open Studios) and the exhibition will be included on all tours of Saarinen House through November. Learn more on our website. What memories this article and photographs “Saarinen/ Slade House” bring back. Congratulations to Kevin Adkisson for his research and writing this. Indeed, the idea back in 1977 was to bring back Saarinen House with some restoration and combine with work of Academy artists,designers and architects. The restoration of the Studio alcove and Studio was a beginning, to be fully realized later in the total restoration of Saarinen House. Also the fireplace was cleaned, Peacock Andirons in place and the chandelier hanging again in the dining room over original table and chairs. Much more was done later. 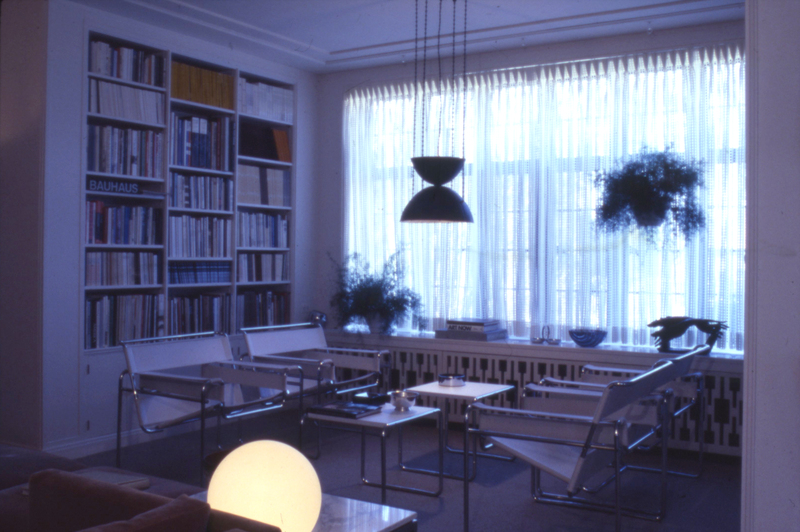 In 1977 the house was of the past and present, a tribute to Eliel Saarinen and Academy artists. Although home of the president, I regarded it as the house of the academy. Students, graduates, faculty, governors, friends and visitors were welcome. Many parties and receptions were given for distinguished guests from Yoko Ono to the King and Queen of Sweden. Both inside and out, the house was a wonderful place to party and entertain. Now part of the museum, the restoration is fully documented in the magnificent publication “Saarinen House and Gardens: A Total Work of Art” by Greg Wittkopp. Much has been written but, suffice to say, many memories remain of this wonderful home and the genius of Eliel Saarinen. Again, thank you Kevin for “Saarinen/Slade House” and all success with the forthcoming exhibition “Saarinen House: Presidents/Residents, 1946-1994”. I am delighted and honored to be included. Happy days!